Gosh, why did no one ever tell me that your late twenties (ahhh, ermahgerd!) are spent battling both wrinkles and pimples?! ARGH. It was time. I needed to buy a foundation. A sales associate could see that I was flailing in the deep foundation waters, and offered to use a nifty little machine to essentially figure out what Pantone swatch my skin matches with, and the corresponding foundations and concealers to match. It's a free service they offer in-stores (why didn't I do this sooner?! ), and it was eye-opening to say the least. I was looking at shades that were a good 2 shades too light and the wrong tone! What?! You guys....get matched. I was looking for hydration, medium coverage, and a dewy finish....and boom! That's what I got. Not too psyched that foundation requires a primer and application with a brush, but I am hoping that the extra little bit of effort when applying will result in (hopefully) bionic makeup that won't melt off in this blasted Texas heat. Have any of you tried these? 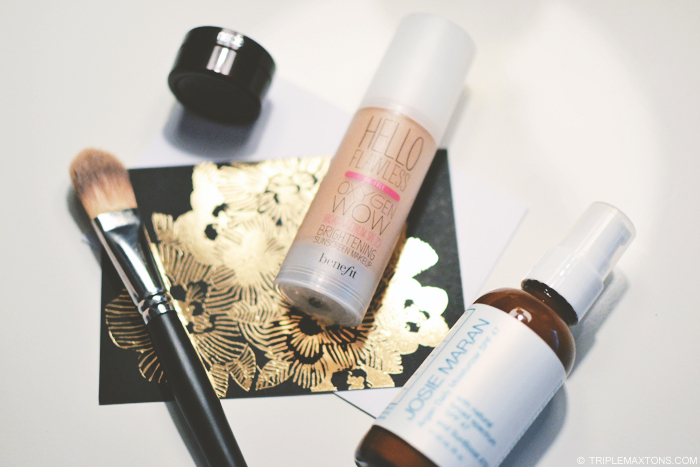 Any favorite foundations or concealers you swear by? Any drugstore kinds you like? WRINKLES! AND I'M NOT EVEN THIRTY!! Thanks for sharing your find - dying to now how it turns out! I love Chanel's Vitalumiere Aqua and have been using it for the past few years. It's not super covering, but I'd rather have the hydration and look of natural makeup than something heavy that masks every last imperfection. On the concealer side, I used to splurge on Cle de Peau and Guerlain's Precious Light Rejuvenating Illuminator, and while both are excellent products, neither is in my budget anymore. As I'm settling into my mid-30s though, I might have to make an exception... I think if any bit of makeup is worth really splurging on, it's foundation.